Newton Aycliffe-based Tekmar Energy is celebrating another major wind energy deal. The firm has been elected by offshore installation contractor Jan De Nul Group to provide its patented Tekmar Cable Protection System (CPS), TekLink Mechanical Latch, for the Northwester 2 offshore wind farm. The product will be produced within Tekmar’s state-of-the-art manufacturing facility on Aycliffe Business Park this year. Northwester 2 will be the sixth windfarm in the North Sea off the Belgian coast, consisting of 23 turbines and will provide a total of 219 MW from its location off the coast of Zeebrugge, in water depth of approximately 40m. The project is set for completion in 2020. Tekmar Energy managing director Russell Edmondson said: “We are delighted for Tekmar to be selected as the cable protection system supplier for Northwester 2. The award also continues the success of Tekmar in the region, after being selected for several adjacent windfarms including Belwind, Belwind demonstration, Thornton Bank 2 and 3 and Borselle 1,2,3 and 4. 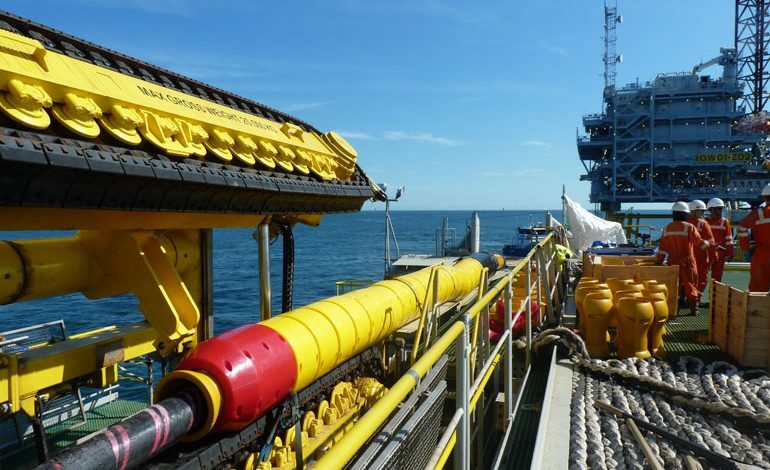 Stan Logghe, senior project manager at Jan De Nul Group, said: “Cable protection systems are vital for protecting the electrical infrastructure of offshore wind farm projects. As part of the project, Tekmar will be supplying their latest TekLink Generation 8 cable protection system for all inter array and export cables. AgileTek Engineering, fellow Tekmar Group company, also supported the project using its proprietary AEL cloud system, providing verification of the cable protection system design via global analysis of the cables and CPS on the project. • Pictured above: Tekmar Cable Protection System on the back of a Jan De Nul Group vessel installing an offshore wind project.